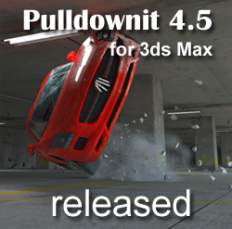 Pulldownit is a brand new dynamics solver which allows for the creation of fractures as well as massive rigid bodies simulations. By using its technology digital artists are able to simulate fast and easily scenes made of thousands of objects in dynamics, collapse buildings, cracking surfaces or fracturing any kind of brittle material. Shatter It! is the new pre-cutting tool of Pulldownit, it is Voronoi-based because this scheme has showed to be the best mathematical pattern for brittle fracture. Its technology allows to pre-cut a 3D model in hundred of shards in seconds, in addition the fragments generated plug easily in the Pulldownit solver to perform simulation in a fast and reliable way. The technology of fracture inside Pdi! is absolutely new and groundbreaking. It allows to fracture any kind of brittle material like stone, glass or stucco. By using it digital artist are able to simulate the collapse of structures or terrain cracking in minutes. Not the least its easy setup and powerful stress tools allow for control in the creation of cracks and drive the simulation to the desired end. Pdi! is currently integrated in Autodesk 3d Max and Maya, It catches the geometry from the viewports and computes the final result as animation keys, It allows to reset the simulation and start again as many as needed also tweaking parameters and resume simulation at any frame, in addition animated objects and characters are able to interact with the simulated ones.